Review posted March 7, 2015. Little, Brown and Company, New York, 2014. All you have to do is look at the cover of this book to get your imagination spinning. And to start laughing. The authors explain in an Introduction how Dinovember got started. They were tired and busy with a new baby in the house. Susan’s parents had sent some hand-me-down toys that their daughters weren’t terribly interested in and languished in a toy box. The next time we saw those dinosaurs was on Halloween. It had been a difficult day. Leif’s sleepless nights had gotten worse. Trick-or-treating had been canceled because Adele was sick, and the kids had gone to bed disappointed and emotional. Susan and I were exhausted, cleaning up after another day spent cooped up inside the house. We could tell our daughters had been desperately bored because even the neglected contents of that toy box had been dumped all over the living room floor. Susan started sorting through them as she cleaned, and held up a couple of the dinosaur figures. 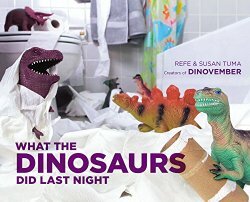 As we got ready for bed, Susan set the dinosaurs on the bathroom sink where our daughters would find them the next morning. I asked what she was doing and she shrugged. We went to bed without giving it another thought. The next morning, our daughters nearly broke down the door to our room. Susan and I dragged ourselves out of bed as the girls looked on impatiently. As soon as our feet touched the floorboards, they grabbed our hands and pulled us into the bathroom. At first glance, it seemed as if the dinosaurs were exactly the way Susan left them – standing in the same places, frozen in the same positions. Then, we looked closer. We looked at our girls’ faces and saw the way they smiled and how their eyes had grown wide. We realized that, sure enough, the kids were right: the dinosaurs had come to life. And, with that, we knew they would do it again. This was how Dinovember was born -- every night of November, the dinosaurs got up to mischief while the children were sleeping. Eventually, the parents took pictures, started a blog -- and wrote a book. At its heart, Dinovember is a celebration of imagination. Imagination is both a prerequisite for participation and, ultimately, what we hope to inspire. We want to train our kids to value their creativity, to cultivate imaginative thinking, and to look past what's possible. The dinosaurs have unwittingly taught Susan and me a similar lesson -- that we can be parents and people at the same time. We've often felt like we had to be either the parents our kids needed or individuals with our own hopes and dreams -- never both at once. When we tried in the past, we seemed to be maintaining two different identities, taking them on and off like costumes in a Metropolis phone booth. We've played with enough plastic dinosaurs by now to know that it doesn't have to be that way. Our kids aren't a hindrance to the things we want to do -- they're integral to everything we do. They're our partners in crime and our grass-stained, runny-nosed muses. They're part of the story we're telling, and, one day, we'll be part of theirs. As for the rest? The photographs say it all. Dinosaurs caught in the act, again and again. I do have one complaint about this book: The print is teeny-tiny. Not good for beginning readers who might learn to read with this book, and not at all good for older eyes hoping to read the book to grandkids. However, you don't actually have to read the words to get yourself laughing out loud. The expressions on the dinosaurs' faces are classic! My main problem is how on earth to classify this book. My library has it as Juvenile Fiction. And if you look at it as the story of "What the Dinosaurs Did Last Night," it works that way. It could be thought of as a Picture Book -- but what about the teeny-tiny print? I think I'm going to list it under adult Nonfiction -- since the authors address adults in their Introduction, and then you can see the book as a book of ideas for parents. And then it does fit under Creativity -- because ultimately, that's what this book is about. But make no mistake: This is truly a book for all ages, and people of different ages will take different things away from this book. This book is something unique -- and a triumph of the imagination. I dare anyone to look at one of these pictures and not instantly start imagining the scenario that got the dinosaurs into that position!